The wine has a fine bead and is golden in color. The nose shows aromas of dates and figs while the palate is concentrated and fruit-driven with floral and mineral overtones. 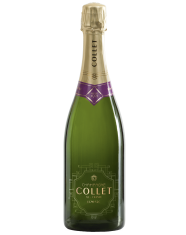 Collet Demi-Sec is perfect dessert Champagne and is also a sublime accompaniment to foie gras and fragrant Asian cuisine.